For points and miles travelers, upper-class travel is either the Holy Grail if you’re new to the game or an occasional dabbler, or the only way to go. Flying first class can be a big drain on points, as many airlines charge more than quadruple the points required for economy class. Business class is often the best deal, giving you access to preferred treatment, including lounges. When you’re flying across the pond, the best thing to do to maximize both comfort and sleep as well as your mileage balance allows, is to use a combination of the business and economy–business there and economy back. I did it for a trip to Greece and used $1,166 worth of miles and cash (100,000 miles and $166 for fees and taxes) to score a flight that would have cost $3,772 if I bought it outright. As glamorous as lie-flat seats sound, you really only take advantage of them when you’re sleeping. So one of the best strategies for trans-Atlantic flights is to get a business-class award (or first class if you’re really flush with points) on the way there and a cheaper cabin on the way back. With lighter planes and better technology, flights seem to reach their destination faster these days, which is great if you need to get somewhere in a hurry, but not when you’re crossing six hours of time zones in about as many hours. If you take that flight in pampering business class, you’re more likely to sleep, be fed good food, and get enough attention to be comfortable. Before you get too excited though, keep in mind that not all airlines allow you to split cabins on rewards, so you’ll need to stick to certain carriers if this is your plan. United Airlines, which I used here, is always a good choice if you have or can transfer miles to its program because they have no fuel surcharges. Delta, US Airways, and American Airlines all allow mixed cabin bookings in theory, but they can occasionally be difficult to implement online. Many international carriers will not allow mixed-cabin awards. For my own business-class experience, I was looking to maximize perks on the way overseas to help me cope with jet lag, so I booked with United miles (to minimize fuel surcharges) on Lufthansa (to maximize lounges and on-board luxury). Lufthansa first-class seats on many planes include a bed completely separate from your seat, but it is one of the hardest awards to get and they only appear on partners’ websites a couple weeks before take-off. Lufthansa business class on the other hand, is quite easy to get. When I first started looking, there were business class seats in the lowest redemption category on nearly every codeshare Lufthansa flight on my departure dates. Since I actually needed to fly to Athens, I was able to get a connection through Frankfurt, Lufthansa’s hub and home to innumerable awesome lounges that I looked forward to sampling, and then another business-class flight on to Athens. When you fly Lufthansa business class on their new planes, you not only get a lie-flat seat (some business classes have angled seats), but you get access to Lufthansa’s premium lounges, some of the most coveted entries around. If I booked this same flight on Lufthansa, I would spend significantly fewer miles, but have much higher fees, particularly since you already incur significant fees just for landing in and departing from anywhere in Germany, especially the hubs. 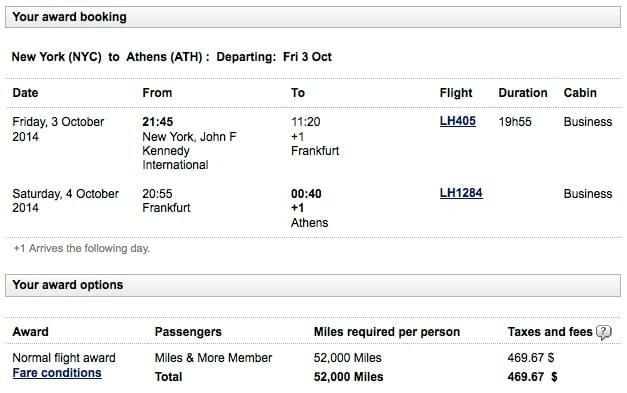 On Lufthansa, I would have used 52,000 miles for the business class seat and $470 in fees on just one leg of the trip. United has unfortunately recently updated its rates for upper class travel, so the first leg of my flight cost 70,000 miles (previously, it would have been just 50,000 miles), but the fees were so low, they made up for the extra miles. The fees on the Lufthansa leg clocked in at $87–not great, but not terrible for expensive airports. The overall expense, if we stick to a one cent per mile valuation, is $787 booking Lufthansa business through United, instead of $990 booking it directly through Lufthansa. On the way back, I picked up a Swiss air economy seat through United on their new Edelweiss service for 30,000 miles and $79 in fees. Since I need to fly back from Munich, I got hit with the pesky high German airport taxes again. Overall, I spent 100,000 miles and $166.90, and from everything I’ve read about Lufthansa’s business class, it looks like it will be well worth every mile.